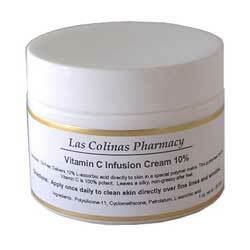 Las Colinas Vitamin C Infusion 10% contains 10% bio-available L-Ascorbic Acid suspended in a co-polymer matrix. This vitamin C infusion formula is a super intensive treatment for your deeper lines and wrinkles that do not respond to other anti-aging products on the market. This creme is concentrated and it does not require refrigeration and will not discolor. A wonderful and powerful antioxidant. L-Ascorbic Acid is efficiently delivered to your problem areas. This is what your skin needs to fight and also helps reverse the damaging and aging effects of free radicals that you get from sun exposure, environmental toxins, stress and other daily activities. It is oil free. Vitamin C Infusion helps to tremendously improve dermal re-collagenation and to resurface skin with accelerated cellular turnover. There are no fragrances! Your skin will be silky and will leave you with a powdery youthful feeling. Las Colinas Vitamin C Infusion 20% contains 20% bio-available L-Ascorbic Acid suspended in a co-polymer matrix. 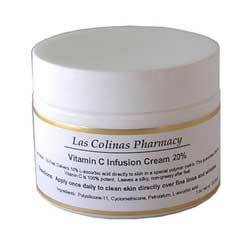 If you have sensitive skin, may we suggest using the Las Colinas Vitamin C Infusion Cream 10% cream. This vitamin C infusion formula is a super intensive treatment for your deeper lines and wrinkles that do not respond to other anti-aging products on the market. This creme is concentrated and it does not require refrigeration and will not discolor.